We’ve already written about activity tracking technology used in fitness apps and wearables. Now, let’s focus on health and fitness app product development. Health and fitness apps can be divided into three categories according to the type of data they store and manage: workout apps, nutrition and diet apps, and fitness activity tracking apps. If you're wondering how to make a fitness app that focuses on workout, you should know that there are a few flavors of workout apps. We will break them down into three broad categories: personal trainer apps, logbook apps, and a workout fitness tracking apps that pair with devices people wear to the gym. Personal trainer apps include pre-arranged exercise routines that can come in different formats: video, illustrations, 3D models, or just text. You can choose a workout that matches your personal preferences, set up a level of difficulty, and start training muscles from the comfort of your home. No gym required. On the left there is a screenshot from Physcult, one of our personal trainer apps. 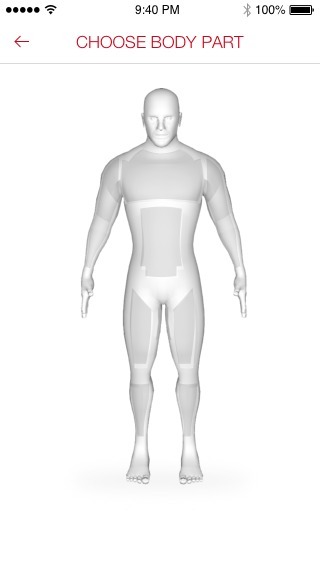 The screenshot illustrates a 3D model where users can pick out the body parts they want to train. Then, the app will offer them video lessons with exercises focused on training selected body parts. Fitstar’s Personal Trainer and Codyapp for yoga are also great examples of video-based apps that, in addition to offering amazing content and top coaches, also have support for smart TVs. GAIN Fitness is another app that offers trainers, workouts and plans that match your personal fitness level and goals. A separate type of a personal trainer is a crossfit app. Crossfit routines are about doing a set of exercises within a certain time period. Crossfit training requires a well-balanced program, and there are a lot of apps that can help users organize their workouts. You check out WODBook for an example of such an app. As great as they are, most personal trainer apps can’t be customized. You can follow routines but you can’t set up your own, which is especially important if you’re a serious gym-goer. A logbook app that allows planning and recording personal exercise routines can be a great solution for gym training. Our concept of a Workout Book (check out the case study) is exactly what I mean. The app features great style and a brilliant interactive design, and doesn’t demand too much attention. Hence, it doesn’t distract users from working out. Fitness app development is progressing very fast. Today we see more and more smart gym technologies appearing. Smart gyms rely on a network of sensors and NFC tags to track user activity within the gym. Smart devices count every rep, set and exercise, log this information, and then present it to you on our mobile app. We just finished a fitness project that fits perfectly in this group of workout apps. Talos Android app lets gym-goers and personal trainers sync their devices with sports equipment, and offers an admin panel for gyms. Read the case study for more information and incredible designs. Just like activity tracking apps, mobile solutions for workouts use gamification features and social elements to motivate users. The Fitocracy app, for example, gives users points, level-ups, and achievements which they can share with other users through a social feed. Pocket Yoga has a system of locked environments which users can unlock if they complete trainings. The Pact app puts user motivation through a carrot and stick approach: users make a weekly Pact with the app to exercise more or eat healthier. Then, the app tracks user progress and pays money to the members who did a good job through the week. Our team provided some support and updates for this already existing project. How do workout apps make money? There are various ways for workout apps to generate revenue. Fitstar’s Personal Trainer and Yoga apps offer a premium subscriptions that unlock access to unlimited HD video trainings. Fitocracy provides their users with a personal coach and exclusively customized nutrition and workout plans for $1 a day. The Pact app charges users for missing gym sessions. Pocket WOD sells sportswear, nutrition and medicaments on their website to earn money. Mobile apps that track your nutrition habits are also activity tracking apps but with more specific functionality. You can add food logging as an additional feature to your fitness tracking solution as Fitbit and Jawbone UP do. But there is a whole audience of users whose only purpose for using a fitness app is to keep to a diet, track calories, and control water and coffee intake. Visualization is very important for a nutrition and diet app. Daily stats should be detailed and comprehensive, but most importantly, they should push a user towards their goals. 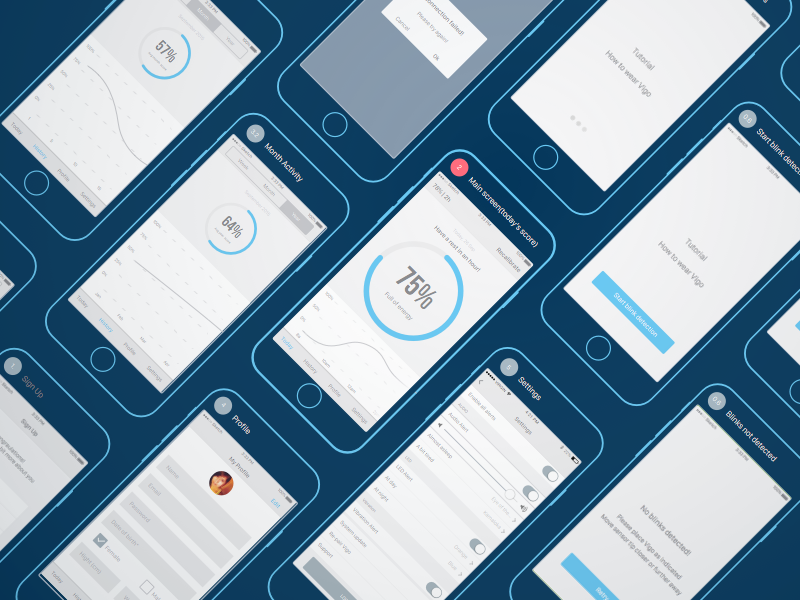 Take a look at our animated graph concept for a nutrition app with meaningful interactions that we’ve recently implemented in Swift. You can also check out the case study of our Eat Fit animation on our blog. The goal of nutrition apps is to help users achieve their personal goals, whether that be healthy eating, losing weight, or even gaining weight. Plotting calories on a graph and sending messages when a user achieves a goal is still not enough. A fitness app should offer calls to action, encouraging users to get off the couch and burn some calories when they have missed their goal. When it comes to documenting food consumption, most nutrition and diet apps rely on manual input, but there are certain ideas you can use to make the process of entering data easier for a user. Just like in a grocery shopping list app, you can build a database with a dictionary in your app so users can quickly add items to their list. Also, an app can remember previously entered items for faster entry in the future with the aid of a word prompter. You can also use geofencing to automatically load the menus of restaurants a user visits. Another useful feature widely used by nutrition and diet apps is a barcode scanner. MyFitnessPal, Fooducate, MyPlate, and Lose It! can log food purchases using barcode scanning. This category includes apps that track physical activity including steps taken, stairs climbed, sleep hours, sleep quality, distance traveled and calories burned. To implement activity tracking capabilities you don’t even need to connect your app to a smartphone’s sensors. HealthKit and Google Fit both offer APIs to access health and fitness data collected on their platforms. You can read our article about how HealthKit and Google Fit can help you develop a health and fitness application. If you want your app to constantly detect and monitor pulse, blood glucose level, and other physiological parameters that are hard to get from a smartphone you can implement a Bluetooth connection to enable data flow from a fitness tracking device. Devices that can be used to extend a fitness app’s capabilities include wristbands and armbands, chest straps, smartwatches, and a lot of others. Some of them can be pretty interesting. In one of our latest fitness projects we designed an app for Vigo, an energy and alertness tracking device backed on Kickstarter. Vigo is a gadget that can be mounted on your ear. Its job is to nudge you when you’re dozing off and give you recommendations about when to take breaks. 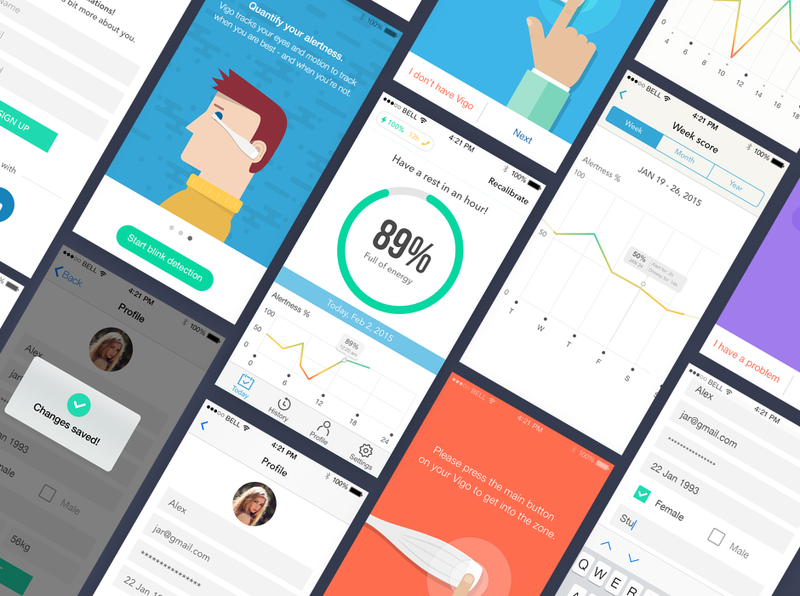 Below are some examples of this fitness app design. Check out this project on Behance and Dribbble. What value can fitness activity trackers offer? Once you have identified what types of information your app will collect and what types of products it will connect with, you should think about how the data will be analyzed, and most importantly, what business problems the app will solve for you and your customers. Desired user behaviors and outcomes can be better realized through gamification, incentives, rewards, or nudges. The Strava Running & Cycling app, for example, has a system of leaderboards and challenges that allow users to compete with each other, win rewards, and gain achievements. Another app called Zombies, Run! requires user to run and walk in the real world to complete the game’s mission and advance through the storyline. If you just want to make the world a better place, you can find inspiration in the Charity Miles app. This app donates from 10 to 25 cents to a charitable organization of choice for each mile covered. How do fitness tracking apps make money? For brands that sell activity tracking devices, mobile apps are just a marketing tool for boosting sales. At the same time, apps that aren’t associated with any wearables mostly rely on freemium models with in-app purchases and in-app ads. For example, the above-mentioned Zombies, Run! has only basic features available in the free version, but you can unlock the rest of the app’s content if you buy a membership. Business models of fitness tracking apps remind a lot of free to play mobile games. If you want to create a fitness app, we suggest checking out how games make money. If you have a great idea for a fitness app, then we would be very happy to hear about it! Because as you can well see, we absolutely love developing fitness apps!